Community Council for Medgar Evers College’s Annual Spring Luncheon is a fun, informative and inspiring gathering of Brooklyn’s community supporters and leadership from all aspects of community governance including: our elected officials and representatives from education, law enforcement, judicial, business, ecumenical as well as Medgar scholars and faculty. 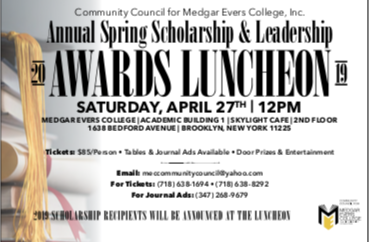 They gather to pay tribute to those who have provided outstanding service in their professions, and especially to support the scholarship program for Medgar Evers College students that is funded by the Community Council. Since 1980, the Council has provided more than $250,000 in scholarships. 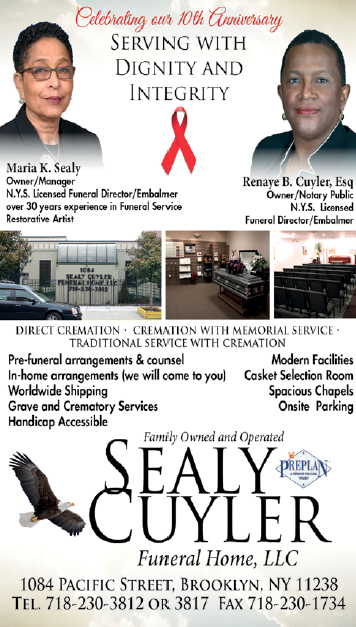 This year’s event will be held on Saturday, April 27th at 12 PM in the Skylight Cafe on the 2nd floor of Medgar Evers College Academic Building #1, 1638 Bedford Avenue. And, as usual, there will be great food, music and live entertainment.